Offering even larger input capacity, the Lexmark C748dte is a suitable choice for offices and workgroups looking for quality and quantity. The C748dte Lexmark laser printer can handle up to 1,200 pages of plain paper media at a time; this can be maximised to up to 4,300 pages with the additional input trays. This device can print as many as 35 pages per minute, and warming up takes no time. Unfortunately, the Lexmark C748dte printer does not offer any multifunction features, though it does offer duplex printing as a standard. 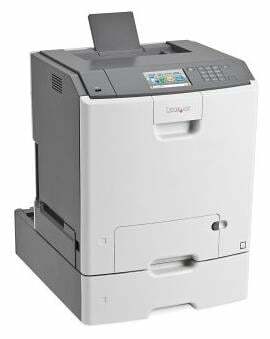 The Lexmark C748dte is a typical colour laser printer with a large LCD touch screen display for easy controls. It has a 300-sheet output bin and an integrated duplex unit for automatic double sided printing. The Lexmark C748dte colour laser printer even has an Ethernet interface for easy network set-up, though high-speed USB still comes as a standard connection option. An additional USB port is also included for direct printing from thumb drives. Some notable features of the Lexmark C-748dte laser printer include its large memory capacity (up to 1536 MB) and its eco-mode, which allows reduced paper and toner waste. The device has a quiet mode for reducing noise while the unit is operating. An optional hard disk can be purchased for additional memory capacity. The C784dte colour printer also offers consistency when it comes to print quality, offering maximum resolutions up to 4800 dpi. High capacity cartridges are available for the Lexmark C748dte printer to help drive down running costs. On the other hand, the Lexmark C748dte colour laser printer does not offer multifunction capabilities like copying, scanning and faxing.